About a month ago, my sweet James caught his foot under him while playing in the basement. We didn’t see the moment that it happened and at two and a half, communication is still less than perfect. At first we thought he’d just stubbed a toe, but after a day went by and he refused to put any weight on the foot, we knew something was definitely wrong. 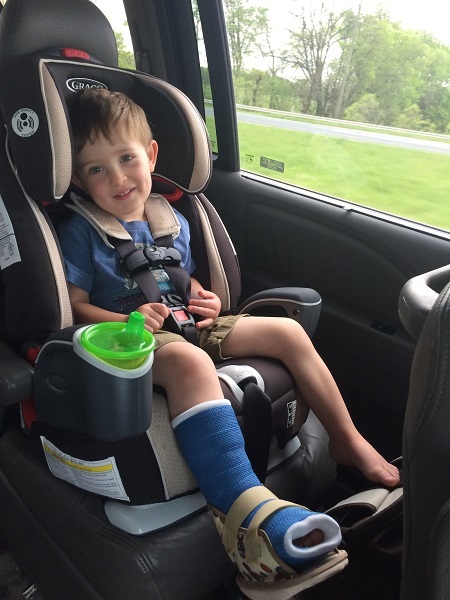 After a trip to the pediatrician, the radiologist, and the orthopedist, he came home with a bright blue cast on his right foot—and a diagnosis: a fractured first metatarsal. There were a few tears at the doctor’s offices, but overall he was a brave boy. He even managed a smile on the ride home. This being my inaugural fractured bone as a mother of four boys, I didn’t know what to expect. But I’ll confess, I feared it was going to be a challenging several weeks. The first night we got home and I was putting him to bed he said, “Shoe off, mommy?” And then I explained to him that his blue boot couldn’t come off for at least four weeks. There were tears and more repeated requests that night and the next for me to take “the shoe” off, but after that he didn’t ask again. Instead, he taught me a few lessons about handling adversity with a sweet spirit. 1) Accept your limitations. 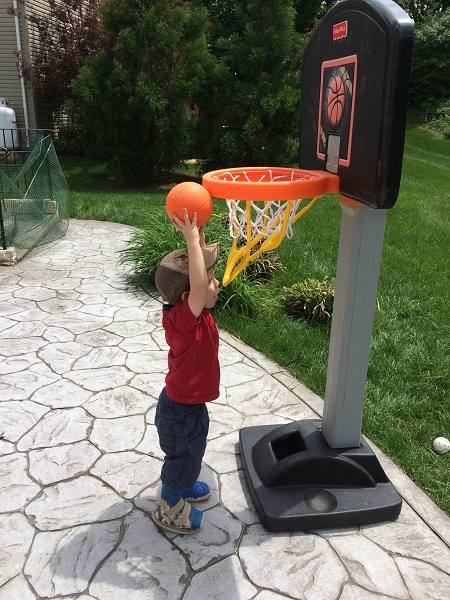 Since it basically rained most days here in the month of May and getting his cast wet was out of the question, we had to set pretty strict rules about him not playing outside most days. And even on the days when it dried up for a few hours, we couldn’t let him play in the grass where it was still wet. Several times he stood at the glass door like a forlorn puppy, while his brothers got to play outside. But he didn’t throw any tantrums or drive us crazy whining. He accepted his limitations with grace and looked around to see what else was available to him. Because no matter how small your yard is, you’ll waste what has been given you if you spend all your time looking at the fence. 2) Discover new strengths. With outside time being off limits and mobility up and down the stairs to the basement being somewhat a struggle, James turned his attention to puzzles. 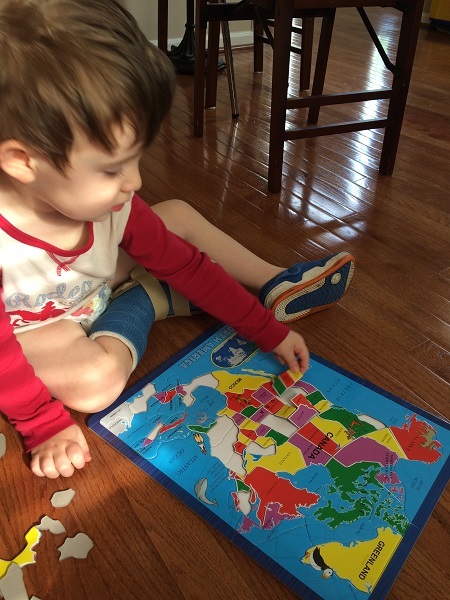 Before he got his cast on, we knew he had a slight interest in puzzles. Now 4 weeks later, he has absolutely amazed us. Since my other boys never really gravitated to puzzles, I didn’t have a whole lot of them around the house. I did, however, have a set of continent puzzles I’d gotten for teaching my 6 year old homeschool geography this year. James started out mastering South America. I was pleased, but with only about a dozen pieces I wasn’t surprised to see him memorizing the puzzle. Then he turned his attention to North America. 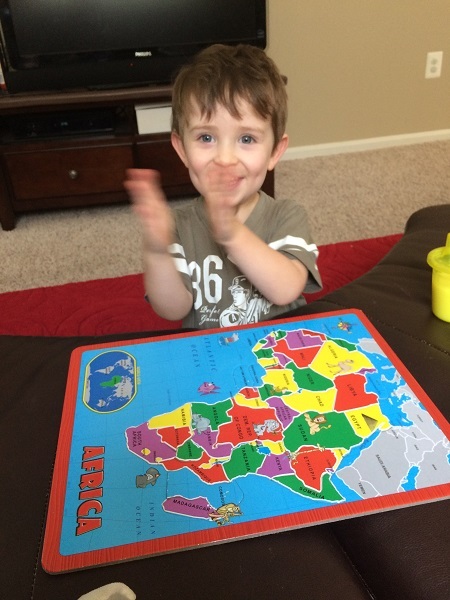 When I noticed that he was matching the shapes of 50 states, Canadian territories, Mexico, Central America and the islands to the puzzle outline I called my husband to stare with me in disbelief. 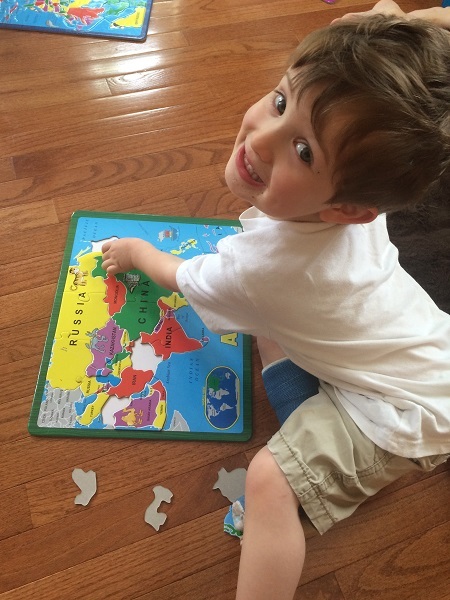 A day later, our 2.5 year old had conquered Asia, Europe, and Africa as well, all the while refusing help from anyone who offered and persevering til he finished the very last piece. If he hadn’t had the cast, who knows if we’d ever have discovered his hidden talent. Sometimes it takes a weakness to discover a strength we didn’t know we had. 3) Love on others. There is only one member of the family less mobile (for the moment) than James and that is baby brother, Beau. 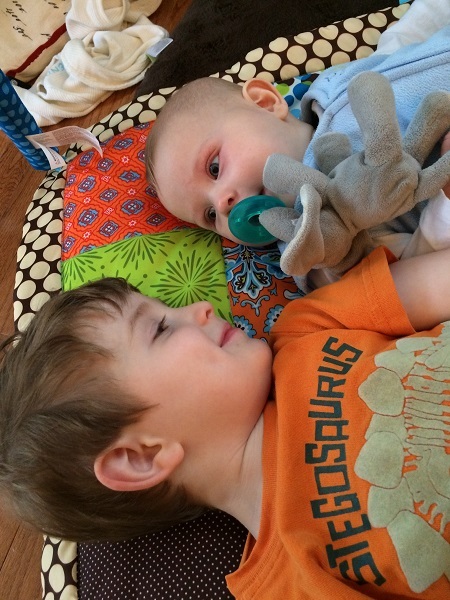 James seized the moment amidst his trial to spend his “down” time with baby bro and give him some love and attention. Because no matter how bad things are, there is always someone else who could use your love and encouragement. 4) Break expectations. 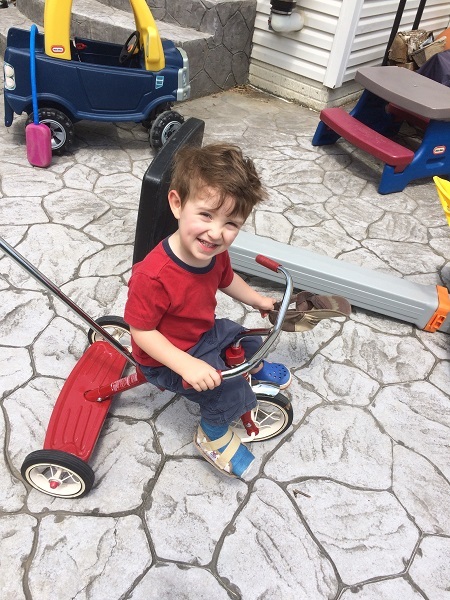 When we finally had a dry enough day to play outside for a bit, with just a little bit of help on and off, James took immediately to his tricycle. Basketball and backgammon were also on the agenda. While we do have to accept our limitations, that doesn’t always mean we have to be defined by them. 5) Let others help. It was so sweet over the course of the weeks with his cast on to watch his brothers learn compassion and service. Each night, Isaiah faithfully prayed for James’ foot to heal. Luke was sweet to offer James his hand or build a special Lego surprise for him. Both boys served him by clearing his plate or bringing him his milk. It was a sweet reminder to this mama that sometimes our trials are God’s opportunities to help others learn service and compassion. 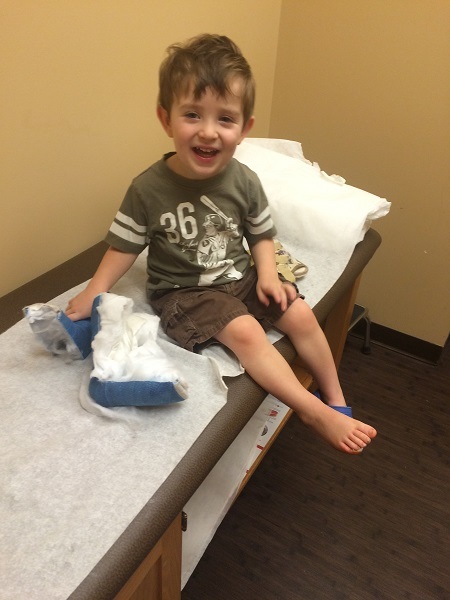 On Tuesday, we went back to the orthopedist. Thankfully, the bone appears to have healed. While James is still a little unsteady, he is on the road to full recovery, but we’re richer from having watched him walk through this trial with such grace. Next time I’m faced with something hard I hope I’ll remember my brave and cheerful little 2 year old and weather the storm with a smile. It was summertime. The car was suffocating, but it wasn’t because of the heat. It was because neither of us were talking. If we hadn’t had 3 kids in the car making their own racket, the silence would have been deafening. The day had started out as a lovely idea—a late afternoon trip to Harper’s Ferry. We’d show the kids where William & Clark laid in supplies for their famous journey; we’d sit out on a patio somewhere and enjoy dinner in the late summer air; and later, we’d walk down to where the rivers meet. But like so many lovely ideas that begin so well in our imaginations, it had ended with us grumpy, irritated, hurt, and frustrated. It was a series of little things: whiny children, overpriced food, a closed museum, pet peeves, unmet expectations and it culminated in a moment where we both felt the other had woefully missed the mark. It was a narrow sidewalk with cars passing. There was a couple kissing in the sidewalk and a lady taking pictures, apparently an engagement photo shoot. I was trying to keep the kids from stepping out into the road. He thought I was being rude to the couple in their special moment. I thought the smooching couple (who had been there for at least 30 minutes trying to capture the perfect on camera smooch) was being inconsiderate of a pregnant woman trying to keep two kids from oncoming traffic (albeit very slow traffic) and a dad with a baby in a stroller. My husband called my name in an exasperated and embarrassed voice. And I felt like crawling under a rock and dying right there I was so embarrassed. He felt frustrated and embarrassed by how inconsiderate I was being. At that moment, I thought he considered someone else’s bride more important than his own. Petty. Small stuff. Stuff that looms enormously large at the moment, in the raw emotion of the moment, but which even a few days or months later just seems insufferably inconsequential. But it’s what we do with this kind of thing that makes marriages either crumble or grow stronger. Do we stuff it down? Do we put on a civil face but inside fume and fester? Do we burrow down in our own little bitterness hideout? Do we bring it up? Snap it in one another’s faces at the most inappropriate times? Do we add it to a list, a list which will come out to hurt and haunt the other at just the worst time or a list which we mull over again and again in a growing pleasure of discontent? Do you see? What do you do with this kind of stuff? Before I got married, I took a trip to the tiny country of Rwanda. In a country, hardly bigger than Maryland, in 100 days, close to 1 million Tutsis and moderate Hutu were killed. I went to interview these brave survivors, to hear their stories and to hear how people who had lost children, parents, a husband or a wife were now radically forgiving those who had hurt them. I heard how former enemies were now caring for one another, helping one another, rebuilding their lives. Now fast-forward 8 summers later. And there you’ll find me—uncomfortably silent, seriously having trouble forgiving my husband for wanting me to move a few inches over out of consideration for someone else on such a special day. Um hello? Yes, I am this petty. I get caught up in my own self, in my own thoughts, in my own agenda. It’s tough sometimes to swallow your hurt and anger and frustration enough to open up this kind of conversation. But if you can, and if you can really listen, often you’ll discover you didn’t have the whole picture. Often you’ll discover a way to have compassion for each other, a way to have empathy for one another. And perhaps, you’ll find it in your heart for what comes next. It leads to me taking the time to get my heart to a place of true forgiveness because I know just how much it matters. It leads to words of forgiveness. It leads to burying the matter in the past and moving ahead together. Because here’s the thing, when we keep that list—the one where we keep track of the wrongs against us—pretty soon we only see our loved one through the hazy lens of that list. 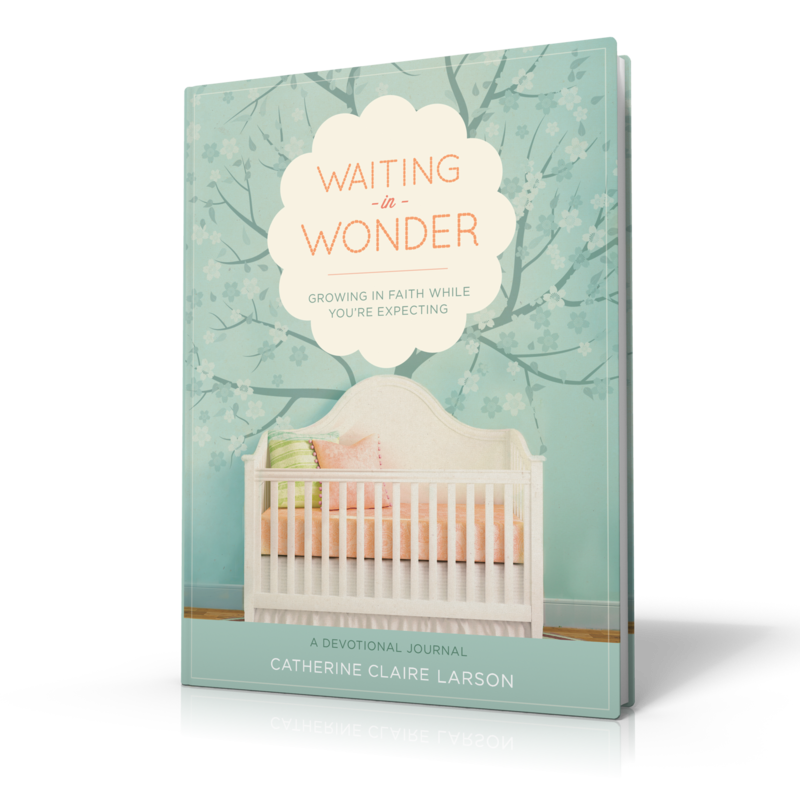 Pretty soon, no matter how hard your spouse is trying or what good things are also happening, every moment is seen through the tainted focus of the list of disappointments and wrongs. And when we stuff it down and can’t talk about the hard stuff, we don’t get to enjoy the intimacy of knowing another better, of loving another with a more intricate knowledge, of discovering empathy. So, before you get to this Valentine’s Day. Could you do yourself and your spouse a favor? If you’ve been keeping a list, or keeping score, or burrowing with the hurt, could you deal with it? In every relationship—be it marriage or friendship or parent-child, we will all play both the part of the offended and the offender. Two little words—“I’m sorry”– wrapped ever so carefully, ever so sincerely, these words can begin a trajectory of restoration. They can begin a conversation of healing. Three words can be given as a gift even before they are spoken. “I forgive you.” True forgiveness—sincere forgiveness–not only is the key to unlock our own prisons of bitterness, but it is also a gift that can change someone else’s heart. It can start to work its miracle before a cold heart has even acknowledged a wrong. Forgiveness thaws. And once that thaw begins… winter’s grip is never again so strong. So, I’ve taken a moment to be vulnerable with you. Would you take a moment to be vulnerable before God? Would you be honest with the ways you’ve been petty? Would you be honest with the things you aren’t forgiving? Would you be honest with the ways you’ve wronged the one you love? Flowers, dinners out, chocolates, or cards mean little if there is an unhealthy relationship just below the surface. 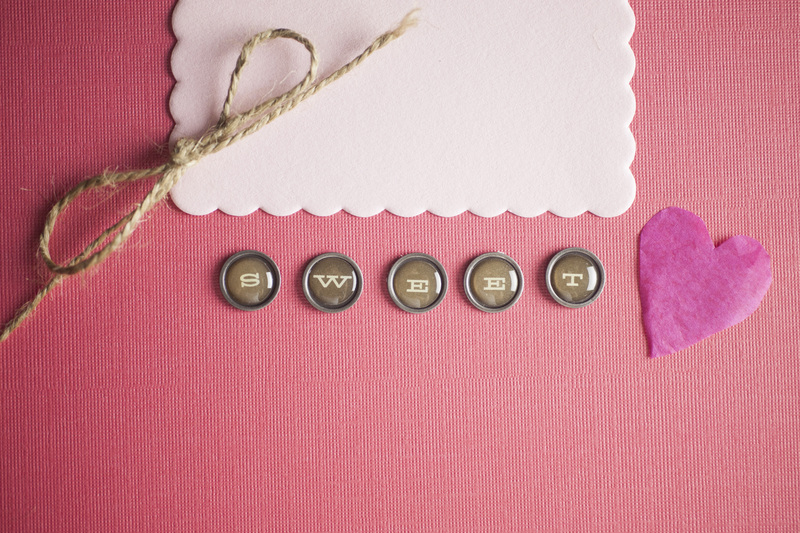 Why not give some better gifts this Valentine’s Day? Before you speak a word to your spouse, talk to God about these gifts. Ask God to show you how you’ve wronged the one you love and ask God to give you the grace to forgive the ways in which you’ve been wronged. Ask Him to help you to turn conflict into opportunities for growth and intimacy. And then ask Him what next. Chances are this gift won’t be quite as easy as flowers and candy, but there’s a guarantee that it will be sweeter. And if you’re new here, I’d love for you to find a friend here in this little corner of cyberspace. I’m reaching out trying to encourage myself and others to live a deep and fearless faith. Hard things like forgiveness are part of it. Radical things like joy are too. Sign up to have these posts delivered to your inbox or follow me on Facebook. I’d love to walk this journey with you. It’s the end of a long day and the floor is strewn with toys. I’ve wrangled the boys to bed and have come downstairs troubled. I’m mulling over the display of attitude I saw in my two-year old, who has learned to sigh loudly when he’s frustrated with my commands, something which he learned from the four year-old, who learned it from me when I’m irritated and frustrated with them. It’s unsightly and unsettling to see my own ugly behavior walking around in front of me. A phone call interrupts my self-reproaching monologue: a friend is calling to inquire about one of our family members who found out last week he is facing cancer. We talk of the unknowns in hushed tones and more aches and anxieties fill my mind, as well as a quiet confidence that the Lord is up to some goodness in the midst of all this hardness. I’m sure my little life is not much different than yours: daily drudgeries, frustrations, sinful patterns—our own and those of others. 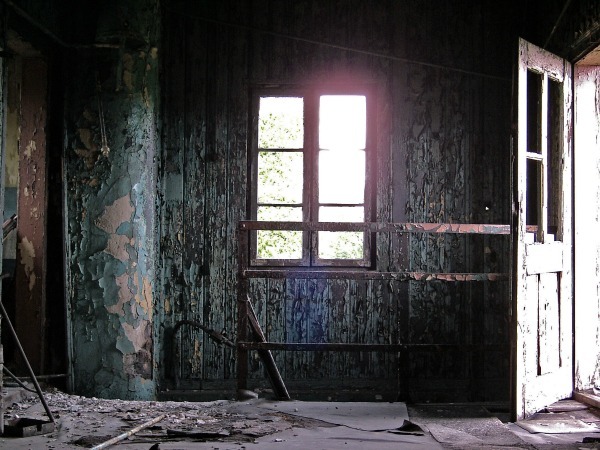 On top of the mundane drip of these daily fatigues, there are the cold harsh realities of sickness, and brokenness, of bitterness and even mortality. And all these wear us thin and threaten to starve our souls. As I hang up the phone, worn down from all of this life I’m living, tired from my day’s work, I find myself with this strange and almost overwhelming urge to go and make something. And I’m being quite literal when I say I’m overcome with a desire to get out my easel, canvas and acrylics and paint. Something or perhaps more aptly, Someone, is drawing me to splash some loveliness around, to soak in the brightness of color, to create something of beauty, and symmetry. I’m beckoned by the thought of standing back from my finished work and feeling that flash of satisfaction, that “It-is-good” moment. And this overwhelming urge to create simply does not compute with how tired I am. It doesn’t make sense. It’s a non-sequitir of sorts. Why have I gone from the hardships of the day to a desire to make something new? And all I can figure out is that somewhere deep inside of us, all this brokenness and frustration and hardship calls out for a bit of beauty and grace. We long for a little plot of land, some small piece of territory where shalom—a sense of wholeness and rightness and goodness—can abound. I think God made us this way. And I think creation is not only good therapy, but somehow an act of defiant hope. Creation may look different for you: maybe it is gardening, woodworking, building a website, sewing, coaching, decorating, cooking, strumming, inventing, or photographing. Maybe you share it with others; maybe you don’t yet. But whatever it is, it is not merely a passive act, but an active one of creating order from chaos, of bringing something of goodness out from the nothingness. Maybe you say you are not a creative person. I say false. All of us are made in the image of God and we all like Him are born with some desire to participate in creation and cultivation. 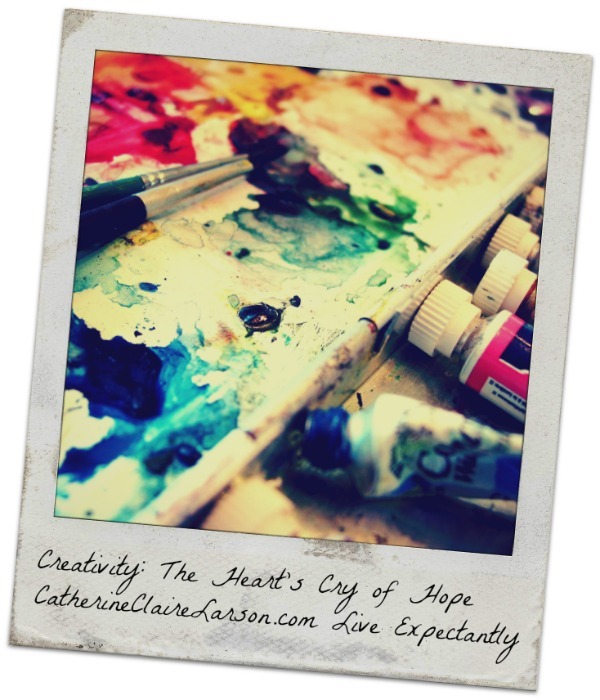 The manifestations of that creative impulse will look very different in our lives but the God-given urge is the same. If you’ve been stifling that creative urge, calling it frivolous, or numbing it in more passive acts of pinning, liking, and channel-surfing, don’t shortchange yourself. There’s an important place for enjoying the work of others. But that’s not all you’re made for. God has made you in His creative image also. You are more than a spectator. Maybe you’re worried that what you have to offer somehow won’t be good enough. Do yourself a favor. Turn off the critic. Give yourself permission to be a learner and to make mistakes. God doesn’t want your perfection. He wants your participation. He wants you to rally your soul in bold hope by participating in some small act of creation. Did you enjoy this post? Consider subscribing to get more thoughts like these delivered straight to your inbox. If this is your first time here, I hope you’ll stay awhile, read a few posts, and find out more about me and my books and writing. And of course, if you liked this post, would you consider sharing it?